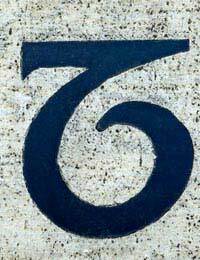 Capricorn (Dec 22nd-Jan 20th) is the tenth sign of the zodiac and is represented by the goat. Capricorns are very ambitious, driven by the need for success, money, position and authority. Their career and succeeding in it is very important to them, so much so that they often prefer to be in charge. But despite their aspirations, they are also very grounded and practical people. Capricorns are ruled by Saturn, the planet of limitations and it is almost as if Saturn realises that time can be short, therefore they are great organisers and planners. However, Capricorns are also patient and willing to wait for what they want. Despite their intense focus on their goals, they can be very witty. They are cautious when making decisions, especially decisions that involve money. Not only are they good at saving money, but they also know how to make good investments. Their materialistic drive to amass wealth is due to a Capricorn's need for security. They are very proud people, who usually repay kindness but more because they do not want to feel as if they "owe" anyone anything. Driven as they are, Capricorns are rarely idle. They have faith in themselves more than in other people and realise if something is going to happen, it is going to be because of their doing. Many see this trait as cold, but Capricorns are merely self-sufficient people. Because they realise time is precious, they are great organisers and capable of paying thorough attention to detail. Capricorns are the most likely sign to marry someone for their money or status in life. Not that marriage will prevent a Capricorn from continuing to be ambitious in his or her own right - even when their partner is more financially and socially powerful, Capricorns need to be in control. Their desire for fame and success, combined with their independent nature and natural inhibition, Capricorns tend to be the loners of the zodiac. Many Capricorns have tunnel vision when it comes to their goals. They disregard everything else - family, friends, even their own emotions - while in pursuit of their goal. They know they have what it takes to complete the job, so the "I don't need you" attitude often turns others off. Capricorns can be seen as odd by others for various reasons. Most do not understand their need for success, their materialistic tendencies, or their perfectionism. They are often focused on one thing at a time, ignoring all others. They can be bossy and domineering and do not quickly forgive those who have crossed them. The bones, joints and knees - Capricorns may find they suffer from stiff joints, rheumatism, arthritis and orthopaedic problems. Capricorns are very determined to rise to the top. They will exert all their energy into achieving a goal, sacrificing relationships if needed. They often wear masks to prevent people from seeing the real person they are, but those who take the time will find Capricorns to be loyal and affectionate. I was born January first. Most people seem to avoid me at more social events, but have a complete turnabout once they need help. I am constantly getting asked (and not just by people I like) to help them with their work. I have had a few failed relationships, because mostly, we didn't see eye to eye on certain things(abortion, Trump, and online gaming). I also am an addicted gamer, but I can stop(but it would be almost impossible). My skills are strategy, good reflexes, very sharp long term memory, and excellent short term memory. I don't believe all of this is Capricorn, but could I get some feedback? Everything here truly defines capricorns. I was born on December 31, and I'm left-handed. As per being fake--capricorns can actually fake things--but it's always a make-believe strategy to show they're in control. Capricorns are self-sufficient, and would prefer learning things on their own, rather than being taught. Capricorns are pretty impatient, too--but they rarely regret their decisions. What's inside of capricorns is bigger than their imaginations--I Believe. They rarely stay long at a job that reduces their value. A capricorn could resign after a week into their newly-found job. Their ego and knowledge overwhelms them. They are pretty reticent, too. I feel like this is pretty freakin on point its creepy. And to the person who said the comment about capricorn being fake. Really bad words to you. Im so blunt it hurts almost impossible not to be real as they come. as a capricorn this true only thing we don't have is patience I have big problem with that speaking for myself I can say that I met a wonderful guy who completed me in such a wonderful way he a scorpio we are unstoppable I can say ???? he change me in such a good way I thank god for putting this men in my life I want greatness within myself I have a lot to learn being a capricorn is a great thing only if you find the inner of yourself. Not quite accurate. Loner, but get lonely. To lonely loner, don't be scared of searching for your mate. Confidence. #1. Don't worry about being rejected. Just keep on keeping on. It WILL happen. Are all of us Capricorns kinda weird ? This article left some traits out and mentions some traits that I definitely do NOT have.But with that said, if I am a loner, how can I go meet girls? Oops didn't realize that I posted the first before I got to edit it. By the way I'm into a cap. what causes a Capricorn to quit his job and get another one. violaine....your statement was about me an Aries female take away the day..today is 3th feb.2016,3: 47am and i am the only one awake in this house and waiting for the the sun to shine to do a lot of things, i tried finding my traits as a capricorn... i love music so much, i love to do a lot of things, but i find it interesting to be an architect or an interior designer, i love photography but i am hooked right now to woodworking and got a couple of tools for this and that job which i have accumulated for the last few decades...i feel i am organized but i need more time to do these organizing tasks, i am meticuolus with details (thats why i love art and music, music with good lyrics), yes i am a pessimist but that is a defense mechanism i guess so when i fail in something then the impact would not be so great unlike if i am all too positive with the outcome...i love to write more about me but time is running out..i gotta to do something..yes we are never idle..my mind is never settled and now at mid forties, my average sleep is 6 hours in a day..i am tremendously immensed in work..but in my free time (if i have) id like to discover new things..i can be very indepedendent but i can be overly dependent on others on some occasion when all else fails..wishing to write more but i gotta go..take out Dr. & I have a Few tools this is me.WOW! I love taking pics so much I a made a wall paper app. Still under construction. It got excepted on Google play store.Things you left out... I love making money to help my family, fishing,camping,sports,violin,piano and playing (billiard) pool. violaine....your statement was about me an Aries female take away the...today is 20th jan 2013, 4am and i am the only one awake in this house and waiting for the the sun to shine to do a lot of things, i tried finding my traits as a capricorn... i love music so much, i love to do a lot of things, but i find it interesting to be an architect or an interior designer, i love photography but i am hooked right now to woodworking and got a couple of tools for this and that job which i have accumulated for the last few decades...i feel i am organized but i need more time to do these organizing tasks, i am meticuolus with details (thats why i love art and music, music with good lyrics), yes i am a pessimist but that is a defense mechanism i guess so when i fail in something then the impact would not be so great unlike if i am all too positive with the outcome...i love to write more about me but time is running out..i gotta to do something..yes we are never idle..my mind is never settled and now at mid forties, my average sleep is 6 hours in a day..i am tremendously immensed in work..but in my free time (if i have) id like to discover new things..i can be very indepedendent but i can be overly dependent on others on some occasion when all else fails..wishing to write more but i gotta go..take out Dr. & I have a Few tools this is me.WOW! I love taking pics so much I a made a wall paper app. Still under construction. It got excepted on Google play store. One thing you left out... I love fishing,camping,sports,violin,piano and playing (billiard) pool. I'm a Capricorn and you just described me I've been having the same goal sence I was seven to play professional baseball and be one of the best I'm 18 now and I'm not stopping to nothing until I get to the top.! Some of these traits are true but I think this article is slightly biased. Nowhere does it mention that Capricorns are one of the most loyal and devoted signs of the zodiac. Loyalty and devotion are wonderful traits and are often more than enough to compensate for some of the more negative qualities associated with Capricorn. Also, there is nothing wrong with being power-hungry, if you genuinely want to use your power for the good of society. today is 20th jan 2013, 4am and i am the only one awake in this house and waiting for the the sun to shine to do a lot of things, i tried finding my traits as a capricorn... i love music so much, i love to do a lot of things, i am a doctor but i find it interesting to be an architect or an interior designer, i love photography but i am hooked right now to woodworking and got an a hundred of tools for this and that job which i have accumulated for the last 2 decades...i feel i am organized but i need more time to do these organizing tasks, i am meticuolus with details (thats why i love art and music, music with good lyrics), yes i am a pessimist but that is a defense mechanism i guess so when i fail in something then the impact would not be so great unlike if i am all too positive with the outcome...i love to write more about me but time is running out..i gotta to do something..yes we are never idle..my mind is never settled and now at mid forties, my average sleep is 6 hours in a day..i am tremendously immensed in work..but in my free time (if i have) id like to discover new things..i can be very indepedendent but i can be overly dependent on others on some occasion when all else fails..wishing to write more but i gotta go.. I'm a Capricorn and this definity me to the T! I've been working hard since i was 15, dont get me wrong I HATE WORKING!, but i gotta do what needs done and i work hard always doing OverTime! This is so funny & also true - my son is almost 2 years old and everything I read sounds just like him. Obviously his goals at the moment are silly to us but if we get in his way all hell breaks loose. When he wants to play with a certain toy no one will stop him & he will completely ignore everything else around him!! I'm a capricorn and I'm so far from these traits it's not even funny. I hate work, I'm very messy, and I can be very easy to read. It just doesn't suit me at all. My boyfriend is a capricorn,and those traits are true. Sometimes I find him hard to understand.but now I have an idea why he is like that. thank you.